Gardeners that have Satsumas, commonly known as orange mandarin (Citrus reticulate), probably have experienced a caterpillar called Orangedog. 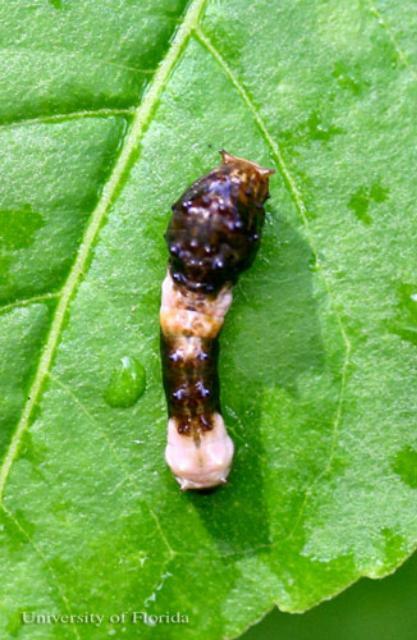 It is a chewing insect that feeds on citrus foliage including Satsuma and a few other plant species. The caterpillar is dark brown with creamy-white, mottled markings and is the larval stage of the giant swallowtail (Papilio cresphontes). 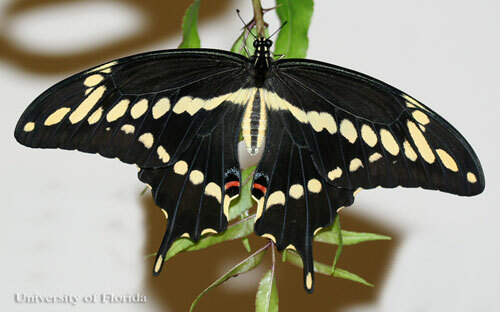 It is a striking, wonderfully “exotic”-looking butterfly that is very abundant in Florida. Young larva of the giant swallowtail, Illustrating bird dropping mimicry. Many who have encountered the caterpillar for the first time describe them as looking similar to bird droppings. They can grow up to 1.5 to 2 inches in length and are the larval stage of the adult giant swallowtail butterfly. Established Satsuma trees can easily withstand the loss of a few leaves by Orangedog feeding. Small or newly planted Satsumas can be infested with numerous Orangedog Caterpillars on occasion, especially a single tree growing in a landscape. A simple control measure consists of finding and crushing eggs and larva (GH-026). Bt, a biological control for most caterpillar species, is effective but should rarely be used since the beauty of this butterfly far outweighs the damage caused by them. Adult giant swallowtail, with wings closed. Add the easy-to-grow garden nasturtium to your vegetable or flower garden! Dress up a ho-hum salad with a vibrant blossom or two just like some of the high-end restaurants. The first taste you experience will be sweetness and then a pleasant peppery flavor emerges. Not only can you eat the flowers but the leaves can also be tossed into your salad and the immature seed pods can be pickled and eaten similar to capers. 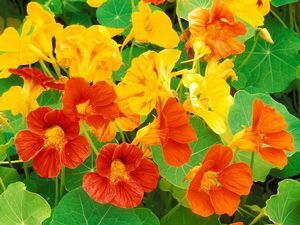 Garden nasturtium, known to botanists as Tropaeolum majus, is an annual that originated in the Andes of South America. Seed and plants are commonly found in garden centers, although a greater variety is available when purchased from seed catalogues or online. A variety of cultivars are available, from dwarf bushy types to climbing or trailing types. Perky blooms in vivid shades of orange, yellow, pink and red are often produced in abundance. This annual is easy and fast to grow from seed. If transplanting from small potted plants, make sure not to disturb the delicate root system during the transplant process. Give them partial to full sun and regular watering, even though they are drought tolerant. They prefer a lighter, sandy, well-drained soil and don’t perform as well in dense, rich soils. Be careful with the fertilizer as too much nitrogen will produce lots of green foliage but few blooms. In the Florida panhandle, garden nasturtium can be a part of the garden year-round. However, they generally decline and stop flowering with the onset of the full brunt of the summer heat unless a bit of afternoon shade is available. When planted late in the fall, they are susceptible to frost damage but often will recover. Garden Nasturtium, Tropaeoleum majus L.
Harvest time is coming for Florida pecan growers. Demand is up, irrigation needs are down, and fungus pressure has been a serious problem over the entire Southeast. 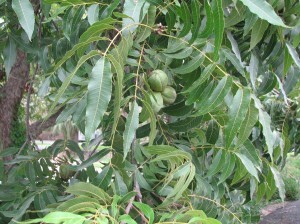 Producers will meet in Monticello on Thursday, September 5 for the annual field day and Pecan Growers’ Association meeting. If you’re a pecan grower, or just considering it, the morning’s topics and speakers will be a great opportunity to learn more about the pecan business. The agenda is below. For more information, contact Jed Dillard at 850-342-0187 or dillardjed@ufl.edu. Please make a lunch reservation by noon Tuesday, September 3. This summer’s rainy and humid weather has created a perfect environment for the proliferation of a variety of fungal diseases. In particular, Cercospora is a genus of fungus of which there are over 1,200 different species. Because there are so many species of this fungus, many different plant species are affected including many garden vegetables and ornamentals. 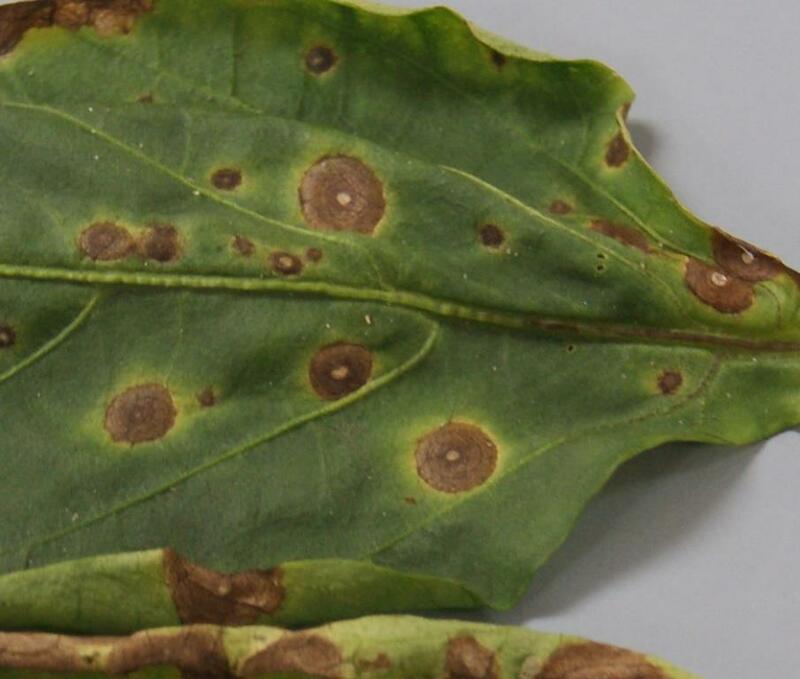 Cercospora causes purple, brown or black spots on a variety of garden vegetables and ornamental shrubs. The spots usually include a grey dead area in the center and a yellow “halo” or “ring” surrounding the entire spot. 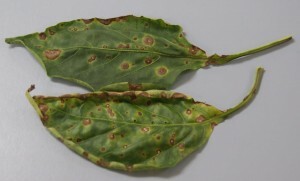 This disease usually starts at the base and interior of the plant, where there is more moisture and less air circulation, and moves outward. Severe Cercospora infections have the ability to defoliate entire plants within a season and kill garden annuals, such as pepper, within a season. 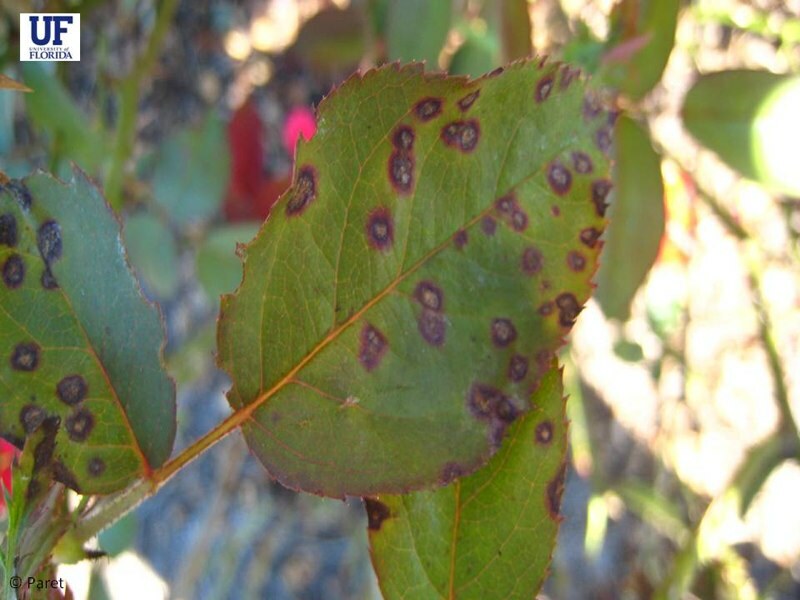 On shrubs, turf and perennials, Cercospora ranges from minor annoyance to major disease depending on the resistance of the cultivar or species. Serious infections can kill some ornamentals, such as Indian Hawthorn or Rose, in three years. Several methods exist to limit the spread and severity of Cercospora outbreaks. It is a good practice to remove all dead plants and leaf litter from the garden. If Cercosproa infection occurs, remove and dispose of dead plants and pick up all leaf litter from the garden immediately upon drop. This will limit the fungal spore’s ability to reproduce. Another preventative strategy is to reduce water splash on leaves. Splashing water spreads Cercospora spores and allows them to take hold on a leaf. Irrigate the vegetable garden or landscape with drip irrigation to avoid wet leaves. Additionally, irrigate in the morning, so plants will not remain wet overnight. Cercospora requires 16 hours of moisture to reproduce. Specifically, infection of Indian Hawthorn has proven to be reduced by switching from overhead to drip irrigation. If fungicides must be used, be sure to follow label directions since some products labeled for the home ornamental garden, such as Chlorothalonil, are not labeled for turf. Be sure to use fungicides with more than one mode of action, since resistance may develop if only one type of fungicide is used. Also, contact your County Extension Office for additional assistance. As if mowing the lawn wasn’t trouble enough, dealing with and disposing of grass clippings is a major pain. Clumps of grass clippings left on the lawn are unsightly and cause the grass beneath them to turn yellow due to a lack of sunlight as well as oxygen. That problem is somewhat eliminated if you have a bag attachment on your mower, but handling the grass clippings extends the chore of mowing by taking extra time and effort to repeatedly empty the bag. Then, once clippings are put in garbage bags and placed on the curb, our municipal waste handlers must deal with them. On the other hand, if we manage our lawns correctly and use proper cutting practices, we can have nice lawns without bagging clippings. 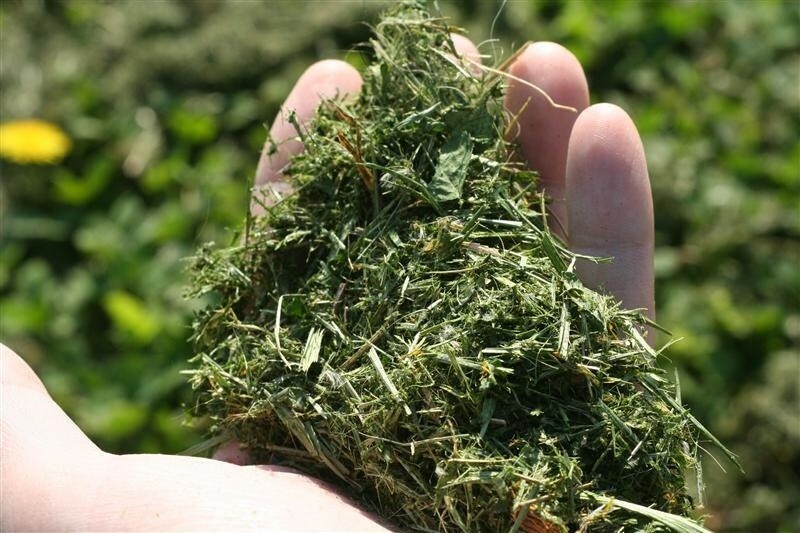 Properly managed, grass clippings will not contribute to thatch buildup or other problems. 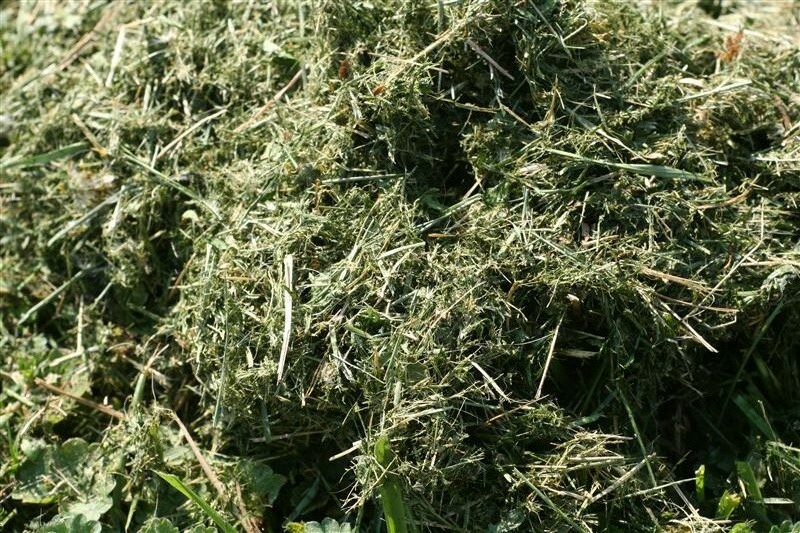 As they decompose, grass clippings also can supply much of the nutrients needed by your lawn. Since you’ve already got it, why throw it away? For an established lawn, cut at the lower recommended cutting heights for your grass and use the lowest recommended amount of fertilizer. Mowing grass at a lower height will discourage thatch build-up. The rule of thumb for when to mow is to remove no more than about one-third of the leaf area at a time. If this practice is followed, the clippings will be small enough to sift into the turf and naturally decompose near the soil surface. To be successful, you will need to mow frequently enough so that the clippings are not too large. This may mean that the lawn can’t necessarily wait until Saturday morning. You must also mow at the recommended height. To ensure that your blade is set at the recommended height, set the mower wheel height on a concrete surface. Common Bermuda: mow at approximately 1½ inches. Hybrid Bermuda: mow at approximately 1¼ inches. Zoysia: mow at approximately 2 inches. St. Augustine: mow at approximately 3 inches. Centipede: mow at approximately 2 inches. Under the bag-free plan, you may apply a second application of fertilizer to your lawn this month (The first application should have been done in late April.). But remember that fertilizing grass increases its rate of growth. Reducing the amount of fertilizer you apply to the lawn will reduce the amount of clippings you will have to deal with. However, the one turf I would completely eliminate from a second fertilizer application annually is centipede. Too much fertilization in centipede can cause many more problems than any benefits that may arise from it. A complete turf fertilizer is recommended for the average lawn. The best is a blend with more nitrogen, little phosphorus and some potash. Fertilizers with nitrogen, phosphorus and potassium ratios of 3:1:2 or 4:1:2 are good for turf. Choose a blend that contains some controlled-release nitrogen for longer feeding. Don’t forget that recycled clippings also add nutrients, so fertilize at one-half the recommended rates – or not at all – if the grass color, growth and general appearance are acceptable. Other practices will add to your success. First, don’t over water your lawn. During the hottest summer period lawns don’t need more than about an inch of water a week. Water as needed for weather conditions, and wait until the grass actually shows some stress before watering. Drought-stressed lawns often appear slightly faded, and the grass blades may be folded or rolled up. Cut your grass when the leaf blades are dry (wait for the dew to dry). The clippings will sift down to the soil better. Make sure your mower blades are sharp, and keep the mower housing clean for best cutting and movement of clippings. You may need to have your mower blade sharpened once or twice in the growing season to properly cut your grass rather than having a dull blade ear your grass. If you own or are thinking of buying a mulching mower, you’ll find they do an excellent job of chopping grass clippings and fit very well into this kind of program. Because these mowers are designed specially to chop grass clippings finely and return them to the lawn, they are a bit more forgiving if you wait slightly longer than recommended before mowing. Always avoid letting the grass get excessively tall before you mow. For more in depth lawn care information, consult “Your Florida Lawn” or contact your County Extension Agent. Asian Cockroach – Is it a Pest of the Home or the Garden? When people first see Asian cockroaches they may think they are seeing little flying moths. Or they may believe they are seeing German cockroaches because the two species look similar. Keen observation will indicate that there are differences, particularly in behavior. In appearance, both German and Asian cockroach adults are about 5/8 inch long and are brown in color with two darker parallel bands running lengthwise behind their head. But unlike German cockroaches, Asian cockroaches are strong fliers with sustained flights of at least 120 feet. As a person is watering a mulched plant bed with a hose, the water disturbs the roaches and they quickly fly out of the mulch, resembling little moths. Or home gardeners may see them flying out of the lawn during mowing. They become active at sundown and are attracted to lights. They often fly inside through any opening in a house such as lighted doorways or windows. Once inside, they fly to and crawl on illuminated television or computer screens and walk on walls while lights are on during the evening. This is when people believe they are seeing a German cockroach invasion in their house, but German cockroaches do not fly. 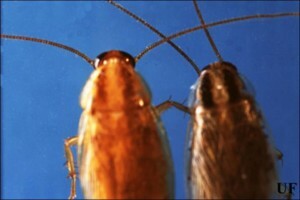 Many people become upset when they see Asian roaches inside their home. The good news is, however, that indoor infestations are rare occurrences. Because they can fly 120 feet or more in a single flight, large areas around a home require treatment. And cockroaches in surrounding untreated areas may result in re-infestation. For additional information on Asian cockroaches and their control, contact your local University of Florida / IFAS Extension Office or Pest Control Operator.